One of the major tasks of playing soccer is kicking the ball. 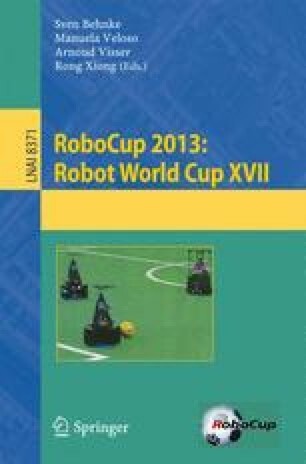 Executing such complex motions is often solved by interpolating key-frames of the entire motion or by using predefined trajectories of the limbs of the soccer robot. In this paper we present a method to generate the trajectory of the kick foot online and to move the rest of the robot’s body such that it is dynamically balanced. To estimate the balance of the robot, its Zero-Moment Point (ZMP) is calculated from its movement using the solution of the Inverse Dynamics. To move the ZMP, we use either a Linear Quadratic Regulator on the local linearization of the ZMP or the Cart-Table Preview Controller and compare their performances.